We were asked by a small group of music lovers to give them somewhere they could collectively voice their thoughts, feelings, loves and hates of music. They required the ability to update frequently but only really had the name to go from. 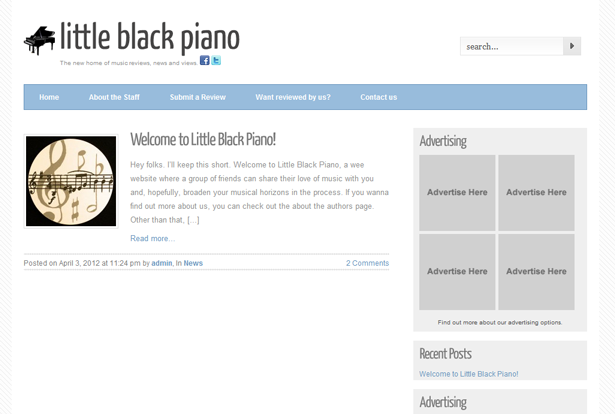 Little Black Piano. After much discussion with the client, we decided that the blog format was probably best suited to their needs. It allowed them to make a number of accounts for their writers and allows the readers to interact with them via commenets. We kept a simple blue and white colour scheme. The client asked us for our thoughts on monetising the site, and we suggested that having blocks of advertising they could sell off might be profitable if they have a high enough readership. "We love our website. We're not really techy minded, and the website is so easy to use. We've been working hard trying to write quality content to put on our website as soon as we could and Swift helped us by talking us through what we needed to do to make that a reality." Researching products and services is the second most popular online activity among Brits with 3 out of 4 UK internet users doing so.